Have you ever wondered “how did we get here” ? Maybe you were on a trip to a new place and got a little sidetracked; or maybe you are thinking about your business, and the twists and turns that have brought you to where you are currently. For me…I have been thinking about my usual, the fine craft and art scene in WNC. ;) How did WNC’s craft culture get to the place it is now? Why does Western NC have more than other regions, when you look at number of artists living and working here, number of galleries and successful art organizations? If you live in the area, you may have heard some of the craft history background that laid the foundation for today’s craft culture; including many women who were in the region in the early 1900’s working hard to educate children and support mountain families. Work which included helping to refine the skills many of these residents already had in their family traditions: weaving, pottery, basket-making, quilting, carving, and furniture making. These women workers included Lucy Morgan who founded Penland School of Craft, Olive Dame Campbell who carried on her husband’s work and started the John C. Campbell Folk School, Eleanor Vance and Charlotte Yale who began The Boys Club to teach young boys in Biltmore Village the skill of wood carving and furniture making...then The Boys Club grew into Biltmore Estate Industries. Growing up in Madison County, just north of Asheville, I know well of the industriousness of families in this community. I had grandmothers who taught me to sew, to quilt, and to pay attention to detail in handwork. My father and uncles can fix and make most anything that needs fixing or making. In addition to their jobs, they farmed and had large gardens, and were good neighbors…I had a wonderful rural upbringing! I was in my late 20’s before I discovered that some of my family made and sold their handiwork through Allanstand Cottage Industries to earn an income in addition to farming the land. 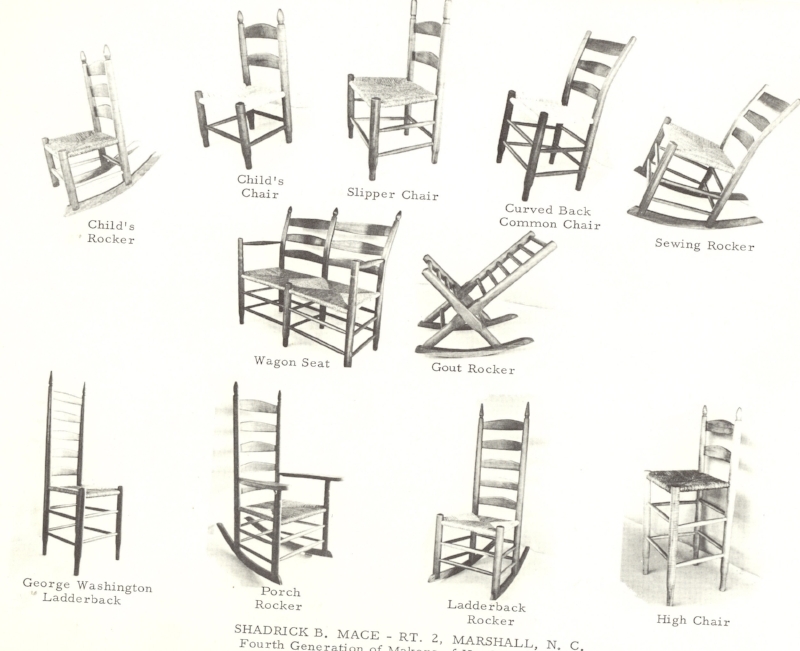 My paternal grandmother was Verlie Mace, and her cousin was Copenny Mace who made chairs. “Settin’ Chairs” they called them. Copenny taught his son, Shadrach Mace, to make chairs and Shadrach made chairs for his living. If you visit the Folk Art Center you can see a few of their chairs on display in the permanent collection of the Southern Highland Craft Guild. I was young when Shadrach Mace died but I remember hearing stories of him. Family, and most everyone, called him by his nickname ‘Birdie’* (from Burdic – his middle name) and Shadrach Birdie Mace had a reputation in the Guild. A part of my present day family could still be described as Jerry Israel described Shadrach…laughing eyes, courtly manner, skilled in handwork. Yes, I’m proud of my craft heritage, and of my home region of Western NC…I’d love to show it to you in greater depth. Contact me for your personalized tour and see more of this place that holds generations of makers stories. Make a connection! – I think you’ll love what you find here. *Interestingly, my Dad called me ‘Bird’ often when I was young. ‘Sherry-bird’ was my nickname just from my Dad. Maybe he’d heard it much in his years around the Mace kinfolk! Master Gardeners Tour is coming up on Saturday, June 3!